"Stuarts" redirects here. For the defunct New England store chain, see Stuarts (store). 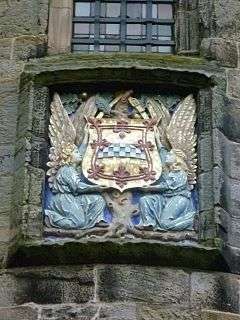 The House of Stuart, originally Stewart and, in Gaelic, Stiubhard was a European royal house that originated in Scotland. 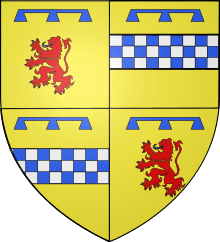 The dynasty's patrilineal Breton ancestors had held the office of High Steward of Scotland since the 12th century, after arriving by way of Norman England. The royal Stewart line was founded by Robert II, and they were Kings and Queens of Scots from the late 14th century through the union with England in 1707. Mary I, Queen of Scots was brought up in France, where she adopted the French spelling of the name, Stuart. Her son, James VI of Scotland, inherited the thrones of England and Ireland upon the death of Elizabeth I in 1603. Except for the period of the Commonwealth, 1649-1660, the Stuarts were monarchs of England, Scotland and Ireland until 1707; then of Great Britain and Ireland, to the death of Queen Anne in 1714. In total, nine Stewart/Stuart monarchs ruled Scotland alone from 1371 until 1603. James VI of Scotland then inherited the realms of Elizabeth I of England, becoming James I of England and Ireland in the Union of the Crowns. Following the Glorious Revolution in 1688, two Stuart queens ruled the isles: Mary II and Anne. Both were the Protestant daughters of James VII and II by his first wife. Their father had converted to Catholicism and his new wife gave birth to a son in 1688, who would brought up a Roman Catholic and would precede his half-sisters; so James was deposed by Parliament in 1689, in favour of his daughters. But neither had any children who survived to adulthood, so under the terms of the Act of Settlement 1701 and the Act of Security 1704, the crown passed to the House of Hanover on the death of Queen Anne in 1714. During the reign of the Stuarts, Scotland developed from a relatively poor and feudal country into a prosperous, modern and centralised state. They ruled during a time in European history of transition from the Middle Ages, through the Renaissance, to the midpoint of the Early modern period. Monarchs such as James IV were known for sponsoring exponents of the Northern Renaissance such as the poet Robert Henryson, and others. After the Stuarts reigned over all of Great Britain, the arts and sciences continued to develop; many of William Shakespeare's best known plays were authored during the Jacobean era, while institutions such as the Royal Society and Royal Mail were established during the reign of Charles II. The name "Stewart" derives from the political position of office similar to a governor, known as a steward. It was originally adopted as the family surname by Walter Stewart, 3rd High Steward of Scotland, who was the third member of the family to hold the position. Prior to this, family names were not used, but instead they had patronyms defined through the father; for example the first two High Stewards were known as FitzAlan and FitzWalter respectively. The gallicised spelling was first borne by John Stewart of Darnley after his time in the French wars. During the 16th century, the French spelling Stuart was adopted by Mary, Queen of Scots, when she was living in France. She sanctioned the change to ensure the correct pronunciation of the Scots version of the name Stewart, because retaining the letter 'w' would have made it difficult for French speakers, who followed the Germans in usually rendering "w" as /v/. The spelling Stuart was also used by her second husband, Henry Stuart, Lord Darnley; he was the father of James VI and I, so the official spelling Stuart for the British royal family derives from him. The ancestral origins of the Stuart family are quite obscure—what is known for certain is that they can trace their ancestry back to Alan FitzFlaad, a Breton who came over to Great Britain not long after the Norman conquest. 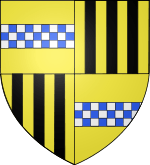 Alan had been the hereditary steward of the Bishop of Dol in the Duchy of Brittany; Alan had a good relationship with the ruling Norman monarch Henry I of England who awarded him with lands in Shropshire. The FitzAlan family quickly established themselves as a prominent Anglo-Norman noble house, with some of its members serving as High Sheriff of Shropshire. It was the great-grandson of Alan named Walter FitzAlan who became the first hereditary High Steward of Scotland, while his brother William's family would go on to become Earls of Arundel. When the civil war in the Kingdom of England, known as The Anarchy, broke out between legitimist claimant Matilda, Lady of the English and her cousin who had usurped her, King Stephen, Walter had sided with Matilda. Another supporter of Matilda was her uncle David I of Scotland from the House of Dunkeld. After Matilda was pushed out of England into the County of Anjou, essentially failing in her legitimist attempt for the throne, many of her supporters in England fled also. It was then that Walter followed David up to the Kingdom of Scotland, where he was granted lands in Renfrewshire and the title for life of Lord High Steward. The next monarch of Scotland, Malcolm IV, made the High Steward title a hereditary arrangement. While High Stewards, the family were based at Dundonald, South Ayrshire between the 12th and 13th centuries. The sixth High Steward of Scotland, Walter Stewart (1293–1326), married Marjorie, daughter of Robert the Bruce, and also played an important part in the Battle of Bannockburn gaining further favour. 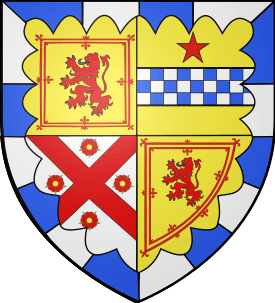 Their son Robert was heir to the House of Bruce, the Lordship of Cunningham and the Bruce lands of Bourtreehill; he eventually inherited the Scottish throne when his uncle David II died childless in 1371. In 1503, James IV attempted to secure peace with England by marrying King Henry VII's daughter, Margaret Tudor. The birth of their son, later James V, brought the House of Stewart into the line of descent of the House of Tudor, and the English throne. Margaret Tudor later married Archibald Douglas, 6th Earl of Angus, and their daughter, Margaret Douglas, was the mother of Henry Stuart, Lord Darnley. In 1565, Darnley married his half-cousin Mary, Queen of Scots, the daughter of James V. Darnley's father was Matthew Stewart, 4th Earl of Lennox, a member of the Stewart of Darnley branch of the House. Lennox was a descendant of Alexander Stewart, 4th High Steward of Scotland, also descended from James II, being Mary's heir presumptive. Thus Darnley was also related to Mary on his father's side and because of this connection, Mary's heirs remained part of the House of Stuart. 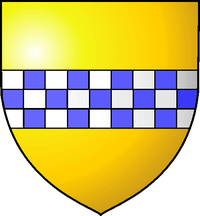 Following John Stewart of Darnley's ennoblement for his part at the Battle of Baugé in 1421 and the grant of lands to him at Aubigny and Concressault, the Darnley Stewarts' surname was gallicised to Stuart. Both Mary, Queen of Scots, and Lord Darnley had strong claims on the English throne, through their mutual grandmother, Margaret Tudor. This eventually led to the accession of the couple's only child James as King of Scotland, England, and Ireland in 1603. However, this was a Personal Union, as the three Kingdoms shared a monarch, but had separate governments, churches, and institutions. Indeed, the personal union did not prevent an armed conflict, known as the Bishops' Wars, breaking out between England and Scotland in 1639. This was to become part of the cycle of political and military conflict that marked the reign of Charles I of England, Scotland and Ireland, culminating in a series of conflicts known as the War of the Three Kingdoms. The trial and execution of Charles I by the English Parliament in 1649 began 11 years of republican government known as the English Interregnum. Scotland initially recognised the late King's son, also called Charles, as their monarch, before being subjugated and forced to enter Cromwell's Commonwealth by General Monck's occupying army. During this period, the principal members of the House of Stuart lived in exile in mainland Europe. The younger Charles returned to Britain to assume his three thrones in 1660 as "Charles II of England, Scotland and Ireland", but would date his reign from his father's death eleven years before. 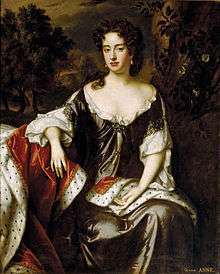 In feudal and dynastic terms, the Scottish reliance on French support was revived during the reign of Charles II, whose own mother was French. His sister Henrietta married into the French royal family. Charles II left no legitimate children, but his numerous illegitimate descendants included the Dukes of Buccleuch, the Dukes of Grafton, the Dukes of Saint Albans and the Dukes of Richmond. Monument to the Royal Stuarts in St. Peter's Basilica – Work of Antonio Canova. These French and Roman Catholic connections proved unpopular and resulted in the downfall of the Stuarts, whose mutual enemies identified with Protestantism and because James VII and II offended the Anglican establishment by proposing tolerance not only for Catholics but for Protestant Dissenters. The Glorious Revolution caused the overthrow of King James in favour of his son-in-law and his daughter, William and Mary. James continued to claim the thrones of England and Scotland to which he had been crowned, and encouraged revolts in his name, and his grandson Charles (also known as Bonnie Prince Charlie) led an ultimately unsuccessful rising in 1745, ironically becoming symbols of conservative rebellion and Romanticism. Some blame the identification of the Roman Catholic Church with the Stuarts for the extremely lengthy delay in the passage of Catholic Emancipation until Jacobitism (as represented by direct Stuart heirs) was extinguished; however it was as likely to be caused by entrenched anti-Catholic prejudice among the Anglican establishment of England. Despite the Whig intentions of tolerance to be extended to Irish subjects, this was not the preference of Georgian Tories and their failure at compromise played a subsequent role in the present division of Ireland. The Royal House of Stuart became extinct with the death of Cardinal Henry Benedict Stuart, brother of Charles Edward Stuart, in 1807. Duke Francis of Bavaria is the current senior heir. However, Charles II had a number of illegitimate sons whose surviving descendants in the male line include Charles Gordon-Lennox, 10th Duke of Richmond, Murray Beauclerk, 14th Duke of St Albans, Henry FitzRoy, 12th Duke of Grafton and Richard Scott, 10th Duke of Buccleuch. In addition, James II's illegitimate son, James FitzJames, 1st Duke of Berwick, founded the House of FitzJames comprising two branches, one in France and one in Spain. The last of the French branch died in 1967 and the last of James II's male line descendants, Cayetana Fitz-James Stuart, 18th Duchess of Alba of the Spanish branch, died in November 2014. 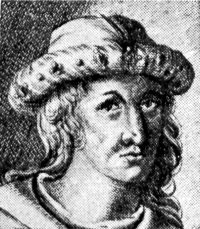 Robert II of Scotland 22 February 1371 19 April 1390 nephew of David II of Scotland who died without issue. Robert's mother Marjorie Bruce was daughter of Robert I of Scotland. Robert III of Scotland 19 April 1390 4 April 1406 son of Robert II of Scotland. 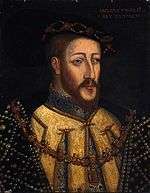 James I of Scotland 4 April 1406 21 February 1437 son of Robert III of Scotland. 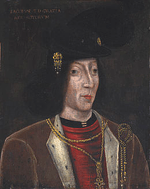 James II of Scotland 21 February 1437 3 August 1460 son of James I of Scotland. James III of Scotland 3 August 1460 11 June 1488 son of James II of Scotland. James IV of Scotland 11 June 1488 9 September 1513 son of James III of Scotland. James V of Scotland 9 September 1513 14 December 1542 son of James IV of Scotland. Mary I of Scotland 14 December 1542 24 July 1567 daughter of James V of Scotland. These monarchs used the title "King/Queen of Great Britain", although that title had no basis in law until the Acts of Union 1707 came into effect on 1 May 1707. Legally, they each simultaneously occupied two thrones, as "King/Queen of England" and "King/Queen of Scotland". 24 March 1603 27 March 1625 son of Mary, Queen of Scots and Henry Stuart, Lord Darnley. King of Scotland alone, 1567–1603, until inheriting the titles King of England and Ireland, including claim to France from the extinct Tudors. Charles I of England, Scotland & Ireland 27 March 1625 30 January 1649 (executed) son of James VI of Scotland & I of England & Ireland. Charles II of England, Scotland & Ireland 30 January 1649 (de jure); 2 May 1660 (de facto) 6 February 1685 son of Charles I of England, Scotland & Ireland. 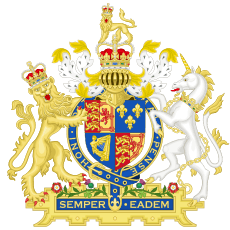 Prohibited by Parliament from assuming the throne during a republican period of government known as the Commonwealth of England, but then accepted retroactively as king. James II of England and Ireland 6 February 1685 13 February 1689 brother of Charles II of England, Scotland & Ireland, who died with without legitimate issue. Son of Charles I. Overthrown at the Revolution of 1688. Mary II of England, Scotland and Ireland 13 February 1689 28 December 1694 daughter of James II of England and Ireland & VII of Scotland, who was still alive and pretending to the throne. Co-monarch was William III & II who outlived his wife. Anne of Great Britain and Ireland 8 March 1702 1 August 1714 sister of Mary II. daughter of James II of England and Ireland & VII of Scotland. Name of state changed to Great Britain with the political Acts of Union 1707, though family has used title since James I & VI. Died issueless, rights pass to House of Hanover. Jacobitism, for more on the legitimist House of Stuart, following the so-called 'Glorious Revolution'. Barony and Castle of Corsehill Stewarton in Ayrshire and the Stuart connection. ↑ While the Earls of Galloway are the senior surviving line of the Stuarts, they descend from a line which originated from the second son of Alexander Stewart, 4th High Steward of Scotland. Thus, they are not members of the Stewart/Stuart royal line, but they are part of the peerage. ↑ The progenitor of the Stuarts was Walter fitz Alan, a Normanised Breton. 5. The existence of surviving direct descendants of King Robert II are still very much alive and healthy. ↑ Mackenzie, A. M., MA., D.Litt., The Rise of the Stewarts, London, 1935, pps.8 -9. ↑ "J.H. Round: The Origin of the Stewarts: Part 1". MedievalGenealogy.org.uk. Retrieved on 13 November 2008. 1 2 3 Bartlett, England Under the Norman and Angevin Kings, 1075–1225, 544. ↑ Lieber, Encyclopædia Americana, 30. 1 2 3 King, The Anarchy of King Stephen's Reign, 249. ↑ Alleyne, Richard; de Quetteville, Harry (7 April 2008). "Act repeal could make Franz Herzog von Bayern new King of England and Scotland". Daily Telegraph. Retrieved 22 June 2008. King, Edmund (1994). The Anarchy of King Stephen's Reign. Oxford University Press. ISBN 0-19-820364-0. Barrow, G. W. S. (2003). The Kingdom of the Scots. Edinburgh: Edinburgh University Press. ISBN 0-7486-1802-3. Barrow, G. W. S. (2004). Stewart family (per. c.1110–c.1350). Oxford Dictionary of National Biography (online ed.). Oxford University Press. doi:10.1093/ref:odnb/49411. Retrieved 11 October 2010. Round, J. Horace (1901). Studies in Peerage and Family History. Westminster, London: Archibald Constable & Co Ltd.
Addington, Arthur C. The Royal House of Stuart: The Descendants of King James VI of Scotland (James I of England). 3v. Charles Skilton, 1969–76. Cassavetti, Eileen. The Lion & the Lilies: The Stuarts and France. Macdonald & Jane’s, 1977. Wikimedia Commons has media related to House of Stuart.